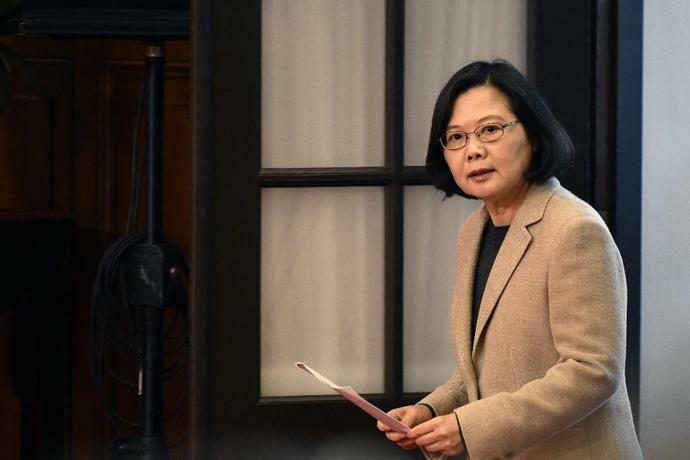 China's manipulation of Taiwan's democratic openness is the biggest threat to the island's security, President Tsai Ing-wen said Tuesday, as she called on Beijing to seek peaceful means to solve their differences. Relations between China and Taiwan have spent two years in the doldrums since the election of Tsai, who has refused to acknowledge Beijing's stance that the island is part of "one China". Tsai's comments came a day before Chinese President Xi Jinping is due to give a landmark speech on Taiwan. It will be closely watched on the island where many have been rattled by the Chinese leader's increasingly muscular rhetoric. Beijing still sees democratic Taiwan as part of its territory to be reunified by force if necessary, despite the two sides being ruled separately since the end of a civil war on the mainland in 1949. China has cut off official communication with Tsai's government and stepped up military and diplomatic pressure. In a New Year's Day speech, Tsai called for Beijing to come to the table but she warned that Taiwan's people would never give up the kind of freedoms unseen on the authoritarian mainland. "What we need is for the two sides to understand and face the reality that both sides are fundamentally different in their values, lifestyles, and political system," she said. Beijing, she added, "must respect the insistence of 23 million people for freedom and democracy" and "must use peaceful and equal terms to handle our differences". She also accused the Chinese government and businesses of taking advantage of Taiwan's open society. "Taiwan's biggest challenge at the moment is especially from China... where it is using our (Taiwan's) democratic system of openness and freedom," she said, citing an influx of viral fake news about Taiwan from the mainland as one example. She also said China had not kept Taiwan adequately informed of African swine fever outbreaks, something she said could hurt local businesses and sow mistrust. Xi's speech on Wednesday marks the 40th anniversary of the "Message to Compatriots in Taiwan", an open letter from China's communist rulers during the reformist Deng Xiaoping era which led to a warming of cross-strait ties. But Xi has adopted a markedly more confrontational foreign policy in recent years and frequently refers to his desire to unite Taiwan with the mainland soon. While Tsai has refused to recognise Beijing's "one China" policy she has walked a careful path within her own party, where some members openly advocate Taiwan declaring independence -- a major red line for China. In her New Year's speech she reiterated that her government was open to direct talks. Tsai's ruling Democratic Progressive Party received a bloody nose in local polls in November and she faces a presidential election in 2020. The main opposition Kuomintang party won a string of key mayoralties in the November ballot and favours much friendlier ties with Beijing. China's People's Liberation Army said its warships, bombers and reconnaissance aircraft had conducted "necessary drills" around Taiwan on Monday. Tsai said Taiwan was resolute in its defense. "China's armed forces yesterday sent a large number of military aircraft and naval vessels into our vicinity.